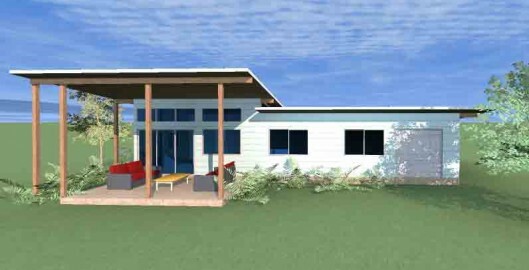 Northern Rivers Rob Acton designs dwellings on the Northern Rivers of NSW Australia. His designs suit the climate and lifestyle of this region. With the development and upgrading of the Pacific Highway the rental market realized a major shortage of permanent or long term rental properties. I remember driving to Alstonville one evening to attend a monthly meeting of the northern rivers branch of the Building Designers Association. Listening to the local radio, the announcer claimed that the RTA had been canvassing all real estate agents from Lennox Head to Ocean Shores to secure all rental accommodation for the influx of workers and employees for the highway upgrade which would take about three years. Since that day, Barefoot Building Design has been busily designing a stable full of secondary dwellings (also called granny flats) for the immediate rental market. Just about anyone with a bit of space in their back yard suddenly wanted to take advantage of a golden opportunity to make a little extra cash from their property, subject to council approval of course. The projects range from luxury two bedroom five star apartments to eco style Straw Bale cottages. Some clients just preferred to fill in their under floor space to include a kitchen, bathroom and laundry for their granny to stay for a visit! As long as the development is within the local council guidelines Barefoot Building Design can . It is an interesting exercise to have to design something so small, as opposed to the usual “bigger is better philosophy”. Once the design process begins we come to realise that we really don’t need much space to achieve a good working floor plan design for a very comfortable home without the large financial burden that usually comes with the old school thought pattern of the McMansion. Barefoot Building Design will always keep a close eye on the design elements that will keep your secondary dwelling building budget in check. Will get back to you in the week about what to do with the back of 137 Stuart St in Mullum.